I found The Accidental to be a fun book to read. It lets the reader into the thoughts and minds of the 4 members of the Smart family. The Smarts have rented a summer house in Norfolk, England. A mysterious 30-ish woman calling herself Amber shows up and embeds herself in their lives. Each chapter alternates between the main characters. Astrid is an angsty 12 year old girl that is obsessed with her camera and spends most of her time filming the world and people around her. Her 17 year old brother, Magnus, mopes in his room and wallows in his own guilt over a classmate’s suicide. Their mother Eve is a writer who spends her days locked away in a shed with a typewriter trying to overcome writer’s block and write her new book. Eve’s husband Michael is a pretentious English professor who has regular flings with his female students. Each member of the Smart family is fairly isolated from the rest of the family. Not one of them knows what is truly going on in each other’s lives. Their family is very dysfunctional. Then the stranger, Amber, shows up at the summer cottage and shakes up each of their lives in different ways. I really enjoyed Ali Smith’s writing style and how she switched that style around in each chapter to give different voices to each character. I can see how some people could get irked by the stream of conscious, the sentence fragments, the minimal punctuation and the lack of quotation marks. I rather enjoy offbeat narrative styles, so The Accidental was right up my alley. Smith did a great job giving each of the Smarts a distinctive personality. My favorite were the chapters that focused on Astrid. Astrid spends most of the summer trying to capture “beginnings” and “ends” with her camcorder. At one point Astrid ponders what the end of the world will be like. She is not afraid to imagine the end. There will be burning chipmunks and skunks hurtling through the air, glowing red in the dark like chipmunk-sized live coals, there will be skunk-firebombs and burning bits of that bridge from San Francisco or bits of film studios and that castle and the fake rides in Disneyland and the Empire State Building, glowing like huge embers, burtling thousands of miles up into the air and down again for miles, gaining speed and then smashing into the clockface of Big Ben, smashing into the House of Parliament, and Waterloo Bridge, and the Eye toppling on its side and all the people in it being thrown about inside the falling capsules like they’re on the inside of snowglobes, and the buildings all on fire, Tate Modern on fire, the art burning, the restaurant buring, the shop burning. My least favorite chapters were the chapters told from Amber’s point of view. These were the only chapters told in the first person and they didn’t pull me in at all. The book makes you ask: what in life is accidental and how well do we know the people in our lives? The Accidental won the 2005 Whitbread Prize for Best Novel. It was also a 2005 Booker Prize Nominee and on the 2006 Shortlist for the Orange Prize. I read The Accidental for book club AND for the 1% Well-Read Challenge and the Book Awards II Challenge. American Gods is another one of those books that has been sitting on my TBR shelf for years. Someone at work recommended it and when I saw it at a used bookstore I picked it up. One of my book clubs selected it as their October book so it was finally time for me to read it. The novel follows Shadow, a large imposing guy who was just let out of prison only to find out that his wife Laura just died in a car accident with his best friend… in a rather compromising position. Shadow is soon recruited by an older man who calls himself “Mr. Wednesday” to be his assistant and bodyguard. Mr. Wednesday soon reveals himself to be more than a mere mortal. He is in fact Odin, a god from Norse mythology. The central concept behind American Gods is that when the immigrants came to America they brought their gods and supernatural creatures with them through the simple power of believing in them. As time went on, the Americans started to forget about these old gods and the gods faded into the background…but… they are still here living amongst us. Their powers are much diminished and their lives are rather lackluster due to the lack of belief in them. The old gods fear that the rise of new gods in America (gods of computers, cars, credit cards) are going to totally obliterate the existence of the old gods. Mr Wednesday with Shadow’s help is trying to get the old gods to unite together against the new gods. American Gods is the first book that I’ve read for the Book Awards II Challenge. For this challenge I need to read 10 award winning books with in a 10 month period. American Gods won the 2002 Hugo Award, the 2002 Nebula Award, and the 2002 Bram Stoker Award. Plath’s novel is semi-autobiographical and tells the sad and gripping story of Esther Greenwood, a 19-year old overachiever who slowly slips into depression and madness. The story is set in the 1950’s in New York City and Boston. Esther is living in the time before the Women’s Rights movement and part of her angst is due to how stifled she feels by society and the gender role that women of the time had to fill. She is unsure of where she should go next with her career, education and love life. I loved Plath’s writing as it had wry humor woven through it. She did an excellent job of capturing the inner turmoil that one can go through. Gyllenhaal was an stellar choice as narrator. I was completely able to buy her as the character Esther. It wasn’t like she was just reading the book, it was as if she was playing the role of Esther Greenwood. I read this book as part of the 1% Well Read Challenge (reading 10 books from the 1001Books to Read Before you Die list). It’s my second book for the challenge… so 2 down 8 to go! I have until February 28, 2009 to complete this challenge. My very first Burroughs! I picked this one up because I saw it was on the 1001 Books to Read Before You Die list and I recently signed up for a challenge to read 10 of the 1001 books in 10 months as part of the 1% Well Read Challenge. This is my first book of the 10. Junky was Burrough’s first book and was published before the start of the Beat movement. The semi-autobiographical Junky details the experiences of Bill Lee, a man who develops a morphine and heroine habit. A junky runs on junk time. When his junk is cut off, the clock runs down and stops. All he can do is hang on and wait for non-junk time to start. We first meet Lee shortly before his first time using drugs and watch as he sinks deeper and deeper into the world of junk. The story is told in a gritty and straight forward manner. Burroughs passes no judgement on drug addiction. Lee’s friends and fellow addicts try to find doctors that will write them scripts and pharmacists who will fill them. They are in and out of jail and “detox”. The book gave me a raw impression of what life as a heroin addict in early 20th century America must’ve been like. As a reader, you watch Lee’s madness and hallucinations. The writing is a simple straightforward narrative, yet very powerful. I found Junky to be a gripping and thought provoking read. I may not have been around for the first Book Awards Challenge, but I am here now for the Book Awards II Challenge (hosted by 3M) . 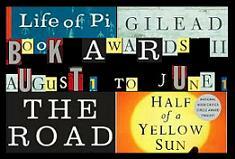 The basic rules: read 10 award winning books in10 months (deadline (June 2009). The list must include winners from at least 5 different awards. These are all books that I already have on my shelf. The rest of the list ist yet to be decided. The 1% Well-Read Challenge is hosted by 3M at 1morechapter. The goal of this challenge is to read 10 books in 10 months from the 1001 Books You Must Read Before You Die list. For you non-math people, 10 out of 1001 is approximately 1%, hence the title. The challenge will run from May 1, 2008 through February 28, 2009. You may change your list at any time and cross-posting to other challenges is permitted. The only requirement is that your ten book choices must be on the ‘1001 List‘.